Two weeks ago, I wrote in my introduction to this column that I was going to watch and review Wong Kar-Wai’s directorial debut film, As Tears Go By (Wong Kar-Wai, 1988). 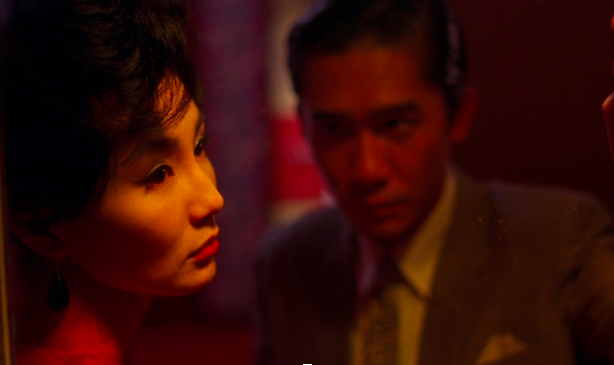 However, I had trouble securing that film, so instead I decided to watch one of his most well-known films, In the Mood for Love (Wong Kar-Wai, 2000). Love, set in Hong Kong in 1962, tells a simple narrative of an unachievable relationship between the two main characters: Mrs. Chan (Maggie Cheung) and Mr. Chow (Tony Leung). Mrs. Chan and Mr. Chow do not fall in love immediately, since they each have a spouse already. It is only when Mrs. Chan and Mr. Chow figure out that their spouses are having an affair with each other that they begin spending more time and developing feelings for one another. Besides the subtle tension between the two main characters, there is not much to the film’s narrative. Yet, this film still managed to capture my attention. Wong Kar-Wai masterfully builds a sensual ambiance by slowing down the film’s temporality at certain moments. For instance, a recurring scene features Mrs. Chan walking up the stairs to her apartment while Mr. Chow walks down the stairs. As the two characters pass each other, they make eye contact. These actions happen in a slow manner because time is manipulated in the editing process, slowing down reality so the audience can witness intimate moments such as the passing eye contact. Here, we can see why the word “mood” appears in the title because time is slowed so we can marvel at the intimacy. Furthermore, the classical music that accompanies these slowed moments heightens our senses, contributing to that sensual feeling. One of my favorite aspects of the film is Wong Kar-Wai’s refusal to conform to Hollywood conventions. In a typical Hollywood film, the camera would always focus on the character who is talking. However, Wong Kar-Wai breaks that convention. For example, we never get to see Mrs. Chan’s husband or Mr. Chow’s wife. We hear their spouses’ voices, but we never see their faces. Another example occurs when Mrs. Chan and Mr. Chow are eating at a restaurant. In a traditional film, we would get a shot of Mrs. Chan speaking and then a shot of Mr. Chow responding. Instead, we get shots of the food, of Mrs. Chan stirring her tea, and of the both of them cutting their steak. These faceless conversations add a mysterious and cautious vibe to the film. This particular atmosphere complements the fact that Mrs. Chan and Mr. Chow sneak around to see each other. I am most amazed by how Wong Kar-Wai takes such a simple narrative and creates a work of art. Not only does he manage to hold an audience’s attention by building subtle tension, he also utilizes the film form to convey a specific effect. In other words, the audience should feel a certain way when watching this film, especially during the scenes where time is slowed down and classical music is played in the background. It is clear that Wong Kar-Wai had a vision when he wrote and directed Love. He took a love story, a cliché genre nowadays, and reinvigorated the story by forsaking Hollywood conventions and experimenting with time, cinematography, sound, and editing. You may have noticed how Moonlight (Barry Jenkins, 2016), the recent winner for best picture at the Academy Awards, is influenced by many cinematic techniques used in Love. It’s great to see that an American director is inspired by Hong Kong’s most famous new wave director, Wong Kar-Wai. Since I am no longer watching Wong Kar-Wai’s films in chronological order, I will be watching Happy Together (Wong Kar-Wai, 1997) next and I am interested in his depiction of a queer couple. David, some know him by his nickname DJ, is a sophomore from the Bay Area. He has plans to major in film and media studies and to minor in English Literature. He enjoys swimming and traveling to different places. Because fall is the season when new and returning TV shows premiere, he will spend a lot of his free time during fall semester watching all of his favorite shows, which include American Horror Story, Scream Queens, and How to Get Away with Murder.